February comes with a short week for many as we pass the first civic holiday in 2017. While many business owners try to run every long weekend into a mini holiday, the demands differ for small business owners. Being the first one into work each day and the last one to leave is the norm for most small business owners, and getting a break from it isn’t always easy. When you’re the one who gets the payroll done and the remittances sent in on time all while building and servicing what is usually the largest client base in your shop, you don’t have much spare time to enjoy on rest and relaxation. Managing your cash flow often sees you paying yourself after everyone else. When there’s more month than money, you become a skillful juggler of all your cash obligations. 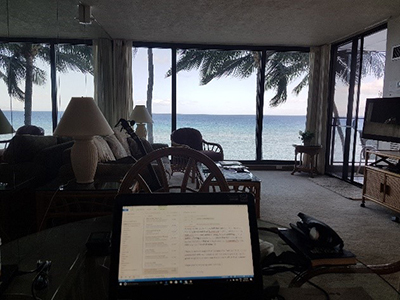 When we first started up our own business, long weekends were always very important to our business success, not because we could eke out a little holiday but because that whole day of uninterrupted desk time allowed us to catch up on paperwork with a little time extra for planning. We sure knew how to get some stress relief in when needed, but no laws govern how many hours the owners are allowed to work when they’re building their businesses, nor do they get paid any overtime. Still, if it is done right, right the rewards in the end can be unbelievable. The toughest boss you’ll ever have will be the person in charge of the business you are running. My computer has a little box in the top right hand corner that keeps me in tune with the weather, both where I’m at in my travels and at my Alberta home. Sometimes, particularly in the spring months when those Chinooks blow in, I’m amused by how close the morning temperatures can be. But, sorry, as I find myself in the middle of the Pacific Ocean now, the temperatures are not close to equal at any time of the day, Chinooks blowing or not! Work in this connected world carries on no matter where you are. Some are always surprised by my answer when they ask how my holiday is going. While some of the places I work are much nicer than the square room in Calgary called an office, I’ve got reports to review, decisions to make, people to talk to, meetings to attend, and staff in need of my support. My “holiday” some days is more of a chore than others. I must confess though, my view is much more relaxing. While the law does not require employers to offer an employee benefit plan, companies commonly offer some form of group insurance as an employee benefit. In large established companies, these employment benefits are expected and for many form an important part of the decision process when entertaining an offer of employment. These group benefit plans usually contain some mandatory provision for participation in the basic coverage such as Life, disability, dental, and extended medical coverage for extra things not covered by provincial healthcare, such as travel insurance, private rooms, and prescription drugs. While these group benefit plans all have similarities, the form of coverage and what is covered often varies. Recently, an employee covered by the Canadian Elevator Industry Welfare Trust Plan was declined coverage for the cost of a plan member’s prescription for marijuana. CBC News Nova Scotia, The Globe and Mail, and the Financial Post, among others, have covered this case. The member filed a complaint against the Trust with the Nova Scotia Human Rights Board. They set down a ruling that failing to cover a doctor’s prescription for marijuana was not only in contravention of the definitions of what was covered and not covered within the plan but that, in doing so the Trust had violated the man’s rights. The insurer was ordered to pay the individual’s current and past prescription marijuana expenses. The ruling is precedent setting, so it would seem that the issue of whether or not marijuana is a prescription drug or not is now defined. I haven’t heard of any such issues in Alberta but, from my perspective as a licensed accident and sickness insurance agent, I would be very proactive in advocating for any client that was denied coverage for any prescription medicine that falls within the authority of a provincial doctor to prescribe. Plans managed by Trusts can be less inclusive in what they cover, but they are subject to the same insurance rules if they’re set up as a group benefits provider. Trying to understand the legalities of what and why such differences have occurred is strange to me. Does anyone have some insight? Regardless of the interesting asides about the processes, it is heartening to note that the very real and effective benefits of this drug are now being acknowledged, not only by the medical community but also in the legal precedent set down about its prescribed use. According to the Financial Post, the returns on investment for the legal operations are also clearly catching up with the new reality. I’ve often written and opined that the social costs incurred in fighting against this naturally growing weed that has been scientifically shown to be far less harmful in its use than other legal mind-altering substances has been a huge drain on our social networks. Every dollar legally earned in these enterprises reduces by a hundredfold the criminal distribution networks activities. Investment capital seems to be getting on board with this new reality. Apparently, the general public is totally and completely confused as to what is covered and what isn’t when it comes to any form of catastrophic loss, especially flood damage. A recent survey by Public Safety Canada has concluded that over 40% of homeowners believe that the federal government will initiate relief programs in the event of catastrophic overland flooding. As we all know, the government’s perspective on flood relief has changed substantially now that “flood” coverage is generally available through private insurers. The initiative to cover flood by private insurers began after the severe flooding issues that occurred right across the country throughout 2013, but the private insurers’ response has been less than 100% inclusive in making this available to the people most likely to be affected by overland water. Since 2013, we haven’t seen any really intense overland water incidents in Western Canada, although some limited damages have occurred in the East. Given this relative lull, our industry should steel itself for the response that’s going to come about the next time major losses occur, like in 2013. People in those areas with catastrophic losses are going to look first to their insurers. When they see the limitations and lack of coverage in the private forms, the pressure will immediately come to bear upon the various governments to deal with uninsured losses. The overall result will be that everyone will be unhappy and looking for someone to blame. Insurance brokers will as usual get the worst of it. The federal and provincial Disaster Financial Relief Programs all require verification that the losses incurred could not have been covered under the homeowners insurance policy. Some of us can remember when the government required a letter from the insurers (not the broker) verifying that the losses a client had were not covered under the insurance form. While claims service is an adjusting function, the task fell to the broker to facilitate the insured’s need for that letter. Can you imagine assessing coverage availability for each of the thousands of people affected by the July 2013 Alberta floods with the kind of coverage options available today? Is the home within 300 meters of running water? Was the damage a sewer backup or an overland flood event? Did you offer the insured coverage and explain the limitations sufficiently? All I can say is that it’s going to be ugly when (not if) this situation presents itself again. The public is not going to be aware of the limitations that will present themselves long after the reports of financial ruin and uninsured losses occur following the events to come. A few news articles such as one in The Star have presented the issue as a caution that the public should read the fine print in their policies. While many of us would read this perspective as a win for the industry, most of the public would see this fine print exclusion as “just another example of the insurance professional’s questionable reputation.” In this article, the writer who is a lawyer calls his insurance broker and is “surprised” to find out that seepage isn’t covered and that an insurance policy isn’t a maintenance contract. As a broker, you’d best make certain that your E&O coverage is in good standing and hope for the best when dealing with water damage claims. You can also mitigate the possible problem by being very clear about the coverage limitations for these perils and collect the best evidence you can that you’ve explained them to the insureds before they leave your office. That best practice is one we should be using for all coverage, isn’t it? If the government wants to get out of having to pay claims for uninsured catastrophic losses, I believe it should set up a facility to cover them: a risk sharing pool for mandatory property damage from overland flood and earthquake. The coverage should come with every policy and include a statute limitation for these perils as a percentage of the policy limits (say 10%). The premium generated should be estimated and pooled like other facility association premiums, and the insurer should adjust every claim for the peril accordingly. Extra coverage to policy limits should be available at the discretion of the insurers and at the premium they decide to charge. In this manner, every insured would be aware of the minor and insufficient limits of coverage and of the option to purchase appropriate limits. That way, we cover our assets when consumers are upset that they don’t have enough coverage in place. The added benefit of the adjudication process would be that the government wouldn’t have to administrate the claims process for insureds who are in a zone where additional coverage can’t be obtained. Such claims would simply be an extension of the adjusting done for the risk sharing pool. Unfortunately, the probability of such a program happening anytime soon is dubious at best. Prairie flood forecasts are “moderate to severe” and qualified by the speed of the spring thaw and the likelihood of precipitation. In other words, no one has any idea as to what might happen, just what could. Some things you can change and others you can’t. One of my father’s frequent rejoinders when I was complaining about the inevitability of certain things was that “Ducks quack. There’s no point in getting angry at them because they do!” That thought is frustrating and calming at the same time! Anatidaephobia is the fear that somewhere, somehow, a duck is watching you!